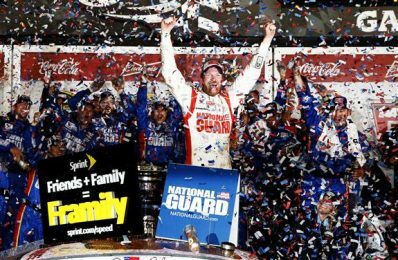 February 24, 2014 — race report by Managing Editor Jacob Seelman — photo courtesy Tom Pennington/Getty Images — DAYTONA BEACH, FL — After what turned into NASCAR’s version of “The Longest Day”, Junior Nation was finally able to rejoice after two years of waiting. For at least one day, all was right in the world again. 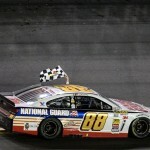 Third-generation NASCAR star Dale Earnhardt Jr., known by many as the “Pied Piper” of Daytona International Speedway, powered out to the lead ahead of Denny Hamlin on a two lap sprint to the finish after a lengthy rain delay to win the 56th running of the Daytona 500, NASCAR’s premier event. The triumph was Junior’s second win in the “Great American Race”, coming a decade after his first triumph in the 500 in 2004, and his 20th career NASCAR Sprint Cup Series victory. The win broke a winless streak of 56 races for Earnhardt Jr., dating back to Michigan International Speedway on June 17, 2012. Earnhardt held off Hamlin, who was looking to become the first driver in NASCAR premier series history to sweep Daytona Speedweeks by winning the Sprint Unlimited, Budweiser Duel and the 500, and 2012 series champion Brad Keselowski for the win in a race that ended under caution after a jarring crash on the final lap coming out of Turn Four. For the third generation driver who watched his father win the 500 after 20 years of heartache and then won it himself in 2004, finally collecting his second Harley J. Earl Trophy was worth the wait. “Winning this race is the greatest feeling you can feel in the sport, aside from … accepting the trophy for the championship,” Earnhardt Jr. said in Gatorade Victory Lane. The Hendrick Motorsports driver delivered car owner Rick Hendrick his eighth career Daytona 500 ring after finishing second three times in his last four attempts in the Great American Race, including a year ago to his teammate Jimmie Johnson. Behind Earnhardt, Hamlin and Keselowski, Hendrick Motorsports teammates Jeff Gordon and Jimmie Johnson, the defending winner of the Daytona 500, completed the top five. The race officially ended under caution after a crash erupted coming off Turn Four and down to the checkered flag when Kevin Harvick squeezed up into Jamie McMurray and sent the two of them plus Kyle Busch spinning through the pack. Reed Sorenson, who had run as high as fourth in Tommy Baldwin’s No. 36 car, and Carl Edwards were also among those swept up at the finish. Denny Hamlin notched his best career Daytona 500 finish, but after a Speedweeks stretch where it seemed he could do no wrong, the Joe Gibbs Racing driver was disappointed about coming so close, even after recognizing how strong his competition was. “I’m so 50/50 on whether I’m pissed off or I’m happy,” Hamlin said after his career-best finish in the 500. “I just don’t know. Hamlin said radio issues that surfaced after the long rain delay returned late in the race, and left him acting as his own spotter. During the daytime portion of the event, it was Earnhardt who led the field onto pit road at Lap 34 following a caution flag for the blown engine of the outside pole-sitter, Martin Truex Jr. Polesitter Austin Dillon led the opening lap in the famous No. 3, making its first appearance in the Sprint Cup Series since the death of Dale Earnhardt in the 2001 Daytona 500, and Kurt Busch and Hamlin also took turns out in front of the 43-car field early on. Then the rains came. Kyle Busch stayed out when half the field pitted at Lap 34 and was scored as the leader when the cars were parked and covered up during a 6 hour, 22 minute and 41 second rain delay and red flag period. NASCAR and track officials worked feverishly to dry the track, and racing finally resumed shortly before 9 PM Eastern time after a few caution laps helped to finish drying the racing surface. Kyle Busch led the field back down to the green flag when it flew again at Lap 46, beginning a 99 lap stretch of green flag racing where pit stops would prove to shape the outcome of the finish. When the pit cycle began at Lap 72, Jeff Gordon brought the first of the frontrunners down pit road, but it was his teammate Kasey Kahne who would have misfortune come his way as Kahne spun on the exit of a still-damp pit lane, losing a lot of track time and ultimately going one lap down. Kyle Busch and Aric Almirola both also lost the lead lap when they left took pit equipment out of their pit boxes (Busch an air gun and Almirola the jack) and had to serve stop-and-go penalties. Danica Patrick and Michael Waltrip both took to the lead of the 500 during these lengthy pit exchanges, with Waltrip looking for his third 500 triumph and Patrick looking to better a career-best eighth place mark from the 2013 running of the event. Patrick would pit on Lap 88 and Waltrip on Lap 90, with Patrick leading for the second-straight year at the Great American Race. Once stops cycled out, it was first Paul Menard and then Jimmie Johnson who assumed the lead as Menard led at the halfway point, Lap 100, which made the race official no matter what had the rains come again. However, they did not, and after another round of green-flag stops which came at Lap 114, it was Earnhardt who brought a tired but still raucous crowd to their feet when he assumed the lead with a spectacular pass on the low lane and subsequent hard-fought battle with Roush-Fenway Racing driver Greg Biffle. But everyone knew the fun couldn’t last forever, and after nearly a hundred laps of green-flag action, it was Lap 145 when the caution flew for the third time as “The Big One” struck and totaled 14 cars. 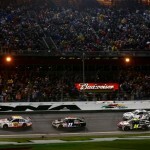 Sparked when Kevin Harvick came up into the Richard Childress Racing No. 33 of Brian Scott, Scott shot up the track into Aric Almirola’s No. 43, when then came across traffic coming into the tri-oval. The crash also involved Menard, Waltrip, Parker Kligerman, David Gilliland, Dillon, Patrick, Kasey Kahne, Marcos Ambrose, Justin Allgaier, Ricky Stenhouse, Jr. and Josh Wise. Danica Patrick took an especially hard hit, pounding the outside wall nose-first in her No. 10 GoDaddy Chevrolet. “What the hell happened?” Patrick asked her crew over the radio after the impact. Once released from the infield care center, both she and Michael Waltrip tried to explain what happened after their respective rides and hard impacts. After that crash, just 50 laps remained in the event and a ferocious battle between Earnhardt Jr., Carl Edwards and Greg Biffle broke out at the front of the field, with Matt Kenseth in the picture as well looking for his third Daytona 500 championship. A second major pileup occurred at Lap 163 when Austin Dillon, the polesitter, made contact with the No. 42 of fellow rookie contender Kyle Larson, who had had problems early on in the event. Larson spun up the racetrack and collected another eight cars, including the 5 of Kasey Kahne, the 7 of Michael Annett, and the 55 of Brian Vickers. Trevor Bayne slowed the field a fifth time when he got loose coming off of Turn Two and clobbered the outside SAFER Barrier, ending his bid for a second 500 crown. The green flew with 12 laps to go and Earnhardt leading, being pushed by the surprise of the night, Reed Sorenson in Tommy Baldwin’s No. 36 car, on the outside lane. Earnhardt, though, quickly ducked down to get a push from his teammate Jimmie Johnson and left Sorenson out up top. Kurt Busch spun out of the pack with 10 laps remaining but was able to get his car refired without a caution and finished the event in 21st position. A crash with six laps to go involving contact between Childress teammates Austin Dillon and Ryan Newman set up the frantic finish. Following the finish, multiple drivers and fans expressed positive feelings and reactions on the popular win. Even Hamlin, who came so close, had good to say to his race-long rival. For Junior, the win was validation of how strong he had been in 2013, after finishing second five times. For his crew chief Steve Letarte, it was an item checked off the bucket list that he wanted so badly to complete. Letarte is leaving Hendrick Motorsports to join NBC as an analyst in 2014. For Earnhardt, he’ll go into Hendrick Motorsports Monday afternoon to ring the victory bell the team has at the shop triumphantly after a two-year drought and a decade of close calls in the 500. But he won’t take it for granted. Sunday night, we saw the smile return to Junior’s face for the first time in a while. It’s as if the weight of the sport, the weight of his drought, and the frustration of every little miscue and close call has finally been lifted off his shoulders. The dam finally burst. The NASCAR Sprint Cup Series resumes with The Profit on CNBC 500 from Phoenix International Raceway on Sunday, March 2nd.